As the hardtracking has endlessly noted, Web publishers are on native advertising like Brown on Williamson. This past April, CNET senior editor Jessica Dolcourt reviewed the Samsung Galaxy S4 smartphone. Under the headline “The everything phone for (almost) everyone,” the CNET veteran journalist gave the device 4.5/5 stars in a detailed, mostly positive review. She did have reservations about the Galaxy S4’s dim screen and “cheaper look” compared to rivals like the iPhone. Fast forward eight months: Dolcourt’s review is now part of a new advertising product CNET sold to Samsung, which purchased the right to promote the editorial review through “CNET Replay.” Visitors to CNET yesterday saw a paid promotion of the review on the homepage, in the midst of the site’s “river” of editorial pieces . . .
Sneaky business as usual, yeah? Welcome to the brave new world of native advertising, where publishers are trying to come up with twists that go beyond standard ads and that carry the whiff of editorial credibility. 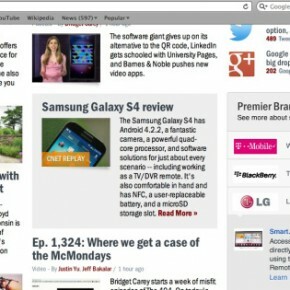 For an advertiser like Samsung, the (mostly) positive CNET review is probably worth more than a display ad bought on the site. [W]hen the reviews I wrote were printed on paper, it was common for the ad sales team to sell a reprint of a review to the supplier, with the magazine logo on, so they could had them out at trade shows or wherever. it never made a difference to what we wrote in the magazines, it didn’t influence the reviews; I don’t know a single reputable journalist who would write a review to be nicer in the hope of selling ads. this looks like an online way to package up the same thing. bought the spot on the home page. An interesting article, and easy to read while driving, thanks to the smooth ride of this 2014 Mercedes.